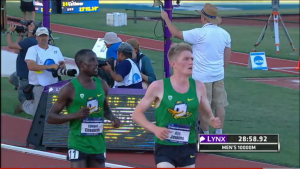 EUGENE, Ore. — What would happen when University of Oregon teammates Edward Cheserek and Eric Jenkins entered the homestretch of the men’s 10,000-meter final together and clear of the field? 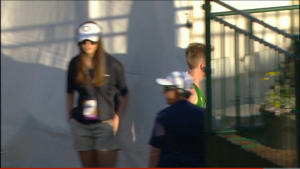 It was the biggest question heading into Wednesday night at Hayward Field and after 9,900 meters of racing at the 2015 NCAA Outdoor Track & Field Championships, we finally received an answer. Before we get into the post-race interviews, body language analysis and all of the hypothesizing that will inevitably come to pass about this race on the message boards, let’s examine the facts of the final 100 meters of Wednesday’s race. 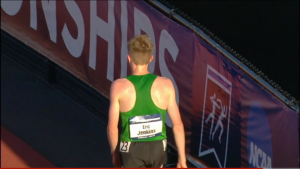 Jenkins, who had taken the lead with three laps to go, held a narrow lead over Cheserek coming off the final bend. Both runners had a sizeable gap over Brigham Young’s Jason Witt in third. They were going to finish 1-2 in some order and give the Ducks 18 points. 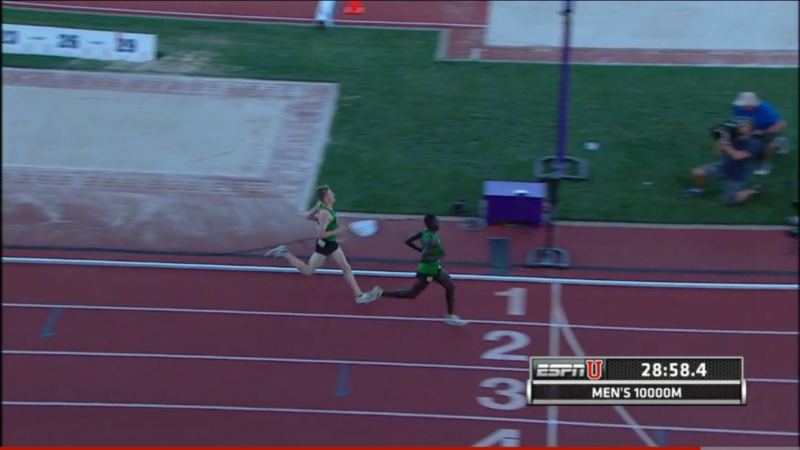 As they turned into the homestretch, Cheserek began to accelerate and passed Jenkins on the outside. A gap began to form, and after about 25 meters, Jenkins also started to speed up. 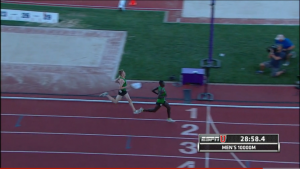 He narrowed the gap on Cheserek (who was turning his head around on both sides to check for other runners) but didn’t catch him. 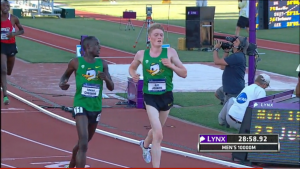 As they neared the finish line, Cheserek remained in the lead while Jenkins had his eyes fixed on the video board beyond the end of the track to ensure that no one was gaining on them. And that’s how it stayed until the line, Cheserek crossing first in 28:58.92 with Jenkins following just .21 of a second later at 28:59.13. 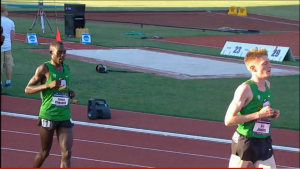 After they crossed the finish line, Cheserek turned towards Jenkins but Jenkins didn’t turn or acknowledge Cheserek. He avoided all contact with Chesrek and quickly exited the track. With the win, Cheserek became the seventh man in history to repeat as NCAA 10,000 champ, and the first since Texas A&M-Corpus Christi’s Shadrack Songok in 2007-08. Those are the facts, and they are indisputable.